This is a wonderful resource book for finding out about your bears and friends. Published by Hobby House, Cumberland, Maryland USA. 207 pages - lots of pictures some coloured, more black and white. This book was published by Jacki Brooks who founded the Australian Doll Digest magazine in 1986. It is a valuable and loved resource book for all bear collectors and lovers. 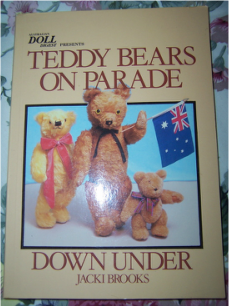 There is 200 pages of bears and bear related items that are more readily found here in Australia. This book is now out of print. 20cm x 14 cm approx. Loose leaf photocopy page of the bear valuations on that era in 1990 for the bears throughout the book. Hard cover book with dust cover. A Quintet Book published by New Burlington Books, London. Identifying Teddy Bears offers an introduction to these much loved toys, tracing their evolution from the very first bear to modern day production. Each one is described in full, with colour photographs, offering key information on manufacturer, distinguishing marks and unique characteristics. Copyright c 1991 by The Hearst Corporation. Hard cover book with its own cardboard slip on cover. It features bears in all shapes and sizes as well as practical advice on displaying, collecting and caring for your own favourite bears. More than 600 detailed photographs from a century of collectibles. The teddy bear has hit a milestone- 100 years as the world's best loved toy. "The Teddy Bear Companion The Centennial Edition, Volume III, is the most comprehensive up to date price guide (of the time) for all collectors of teddy bears and their collectible plus friends. It also provides an historical perspective on the history of the teddy bear industry as well as descriptions and values of over 600 bears and soft toys. 8 inspiring projects to make. Plus feature articles,basic bear making techniques, two great Teddy outfits, latest Auction News. Insert Bear pattern sheet still attached. Take a trip Down Memory Lane and see Bear Artists which have been featured in previous publications. See highlights of the Melbourne Teddy Event. Amber the Panda pattern insert still attached. .easy to make and fun to paint. This book is in excellent condition and has lots of information about bears in it. This book is a first edition and was printed in 1993 by Bison Books in Hong Kong. "IN PRAISE OF TEDDY BEARS"
It is an illustrated survey of Teddy's history, a scrapbook of his attainments, and an intimate photograph album. It is an A-Z of the most famous bears in the world, a compendium of the record breakers, and a revelation about Teddy exerts such a fantastic appeal. It is illustrated in black and white and colour. The dust cover has been covered with plastic and backed with brown paper to keep it in good condition by a previous owner. This book begins with the history of the teddy bear from its inspiration, Teddy Roosevelt, to its emergence as a soft, furry toy through the genious of the German company, Steiff. There is a section on how teddy bears are made, followed by a visit to some of the most imaginative and talented bear makers and bear artists. 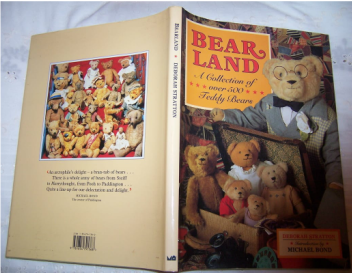 Bearland itself is populated by almost as many types of bears as there are humans. They come in different colours, shapes and sizes. Sometimes they are attrattively costumed, prepared to climb mountains, cook meals or go to parties. Over 200 photos of bears from Britain, Europe and America. (some curling to top edge of dust cover) .